There is such focus on a child’s physical health and seldom focus on mental health. The importance of a child’s mental health is as, if not more important than physical health. Having low Emotional Intelligence, also known as “EQ”, Emotional Quotient can be damaging to a child. Research has shown that EQ is more important than IQ in determining our success in life, both as individuals and in our relationships with others. Dr. Peter Salovey and Dr. John D. Mayer defined emotional intelligence as, “the subset of social intelligence that involves the ability to monitor one’s own and others’ feelings and emotions, to discriminate among them and to use this information to guide one’s thinking and actions” (1990). How Does Emotional Intelligence and the Gordon Model relate? 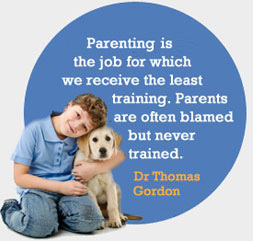 The Gordon Model is the basis of Parent Effectiveness Training. Inherent in the Gordon Model is the idea that people have the need and the capacity to be emotionally intelligent. We want to do more than to survive; we want to meet our higher order needs for self-actualization and self-fulfillment. And equally important, we want to have mutually satisfying, enduring relationships with others–our spouses, partners, children, managers, teachers, parents, friends. These are universal human needs. Underlying all of the Gordon Model programs is the belief that people can learn the skills that they need both to take responsibility for their own lives and to have effective and satisfying relationships with others–at work, at home and at school. Awareness and knowledge are necessary, but they’re not sufficient. Equally important is competence in interpersonal skills. This is the reason why our programs are skill-based–for example, we don’t just talk about the importance of being an empathic listener, a clear self-discloser or an effective conflict-resolver, we offer a proven technology for exactly when and how to use these skills and provide the time and opportunity for people to practice them. How can P.E.T. improve your child’s “EQ”? P.E.T. can teach a child how to become a better listener and learn clear communication skills that will strengthen and enrich relationships with both family and friends. Your children will feel free to discuss their problems and concerns with you instead of withdrawing. You’ll experience fewer angry outbursts and more problem-solving. Everyone can participate in rule-setting so all will feel motivated to comply with the rules. Fewer power struggles–less tension, less resentment, more fun, more peace, more love. As a parent I was struggling and dreading getting ready in the mornings for school and work. I learnt how I was not communicating with my children but using my “power” over them. The program has had a very positive effect in my relationship with my children and now sometimes things are done without my asking.